The Huna Basics Course is a one-day course that can be taken as part of the Hunaquest Course or separately for those who cannot or do not want to take the longer course. Huna Basics covers the Seven Principles of Huna and the Three Selves from the Kahili Family tradition as passed on by Serge Kahili King. All materials and notes will be provided but reading "Urban Shaman" would be helpful. This class is meant to familiarize those who are new to the Huna work with the fundamental concepts, and it will be a great review for those who have been away from it or just want a refresher. 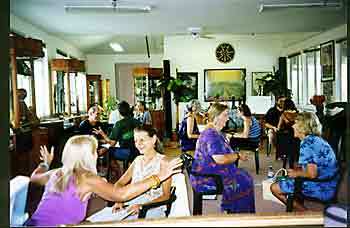 It will allow those who participate to get much more out of the Advanced Huna Healing and other courses presented by Aloha International. It is also available to people who will not be taking the advanced courses but are interested in knowing the basics which they can immediately start to use for benefit in their lives. Spouses and family of the longer training participants who are coming to the Island may especially be interested.